Harvest. The very word conjures up warm feelings – thoughts of spending time with friends and neighbors, anticipating the good things that result from careful nurturing. On the lovely fall evening of November 1, all of that and everything else we love about this season was in evidence at Seeds of Strength’s first Harvest Fest, held in The Polo Barn at the J.M. Page House in Georgetown. Members, guests, and representatives from our 2018-2019 community partners mixed and mingled. This was one of the most attended of all SoS events, with 163 people enjoying the evening. The evening’s theme was “Celebrating the Seeds We Have Sown” and that’s what we did. Terri Boroczk, Seeds of Strength Compliance Chair, opened with a warm welcome to all, letting us know the event agenda was basically… well, no agenda except to socialize. Representatives from each of our ten current community partners each hosted a table, giving everyone the opportunity to visit and interact personally with each grantee. Terri also announced that some SoS-sponsored site visits in the coming months to the grantees’ operations would be open to SoS members. Watch your SoS email for details! 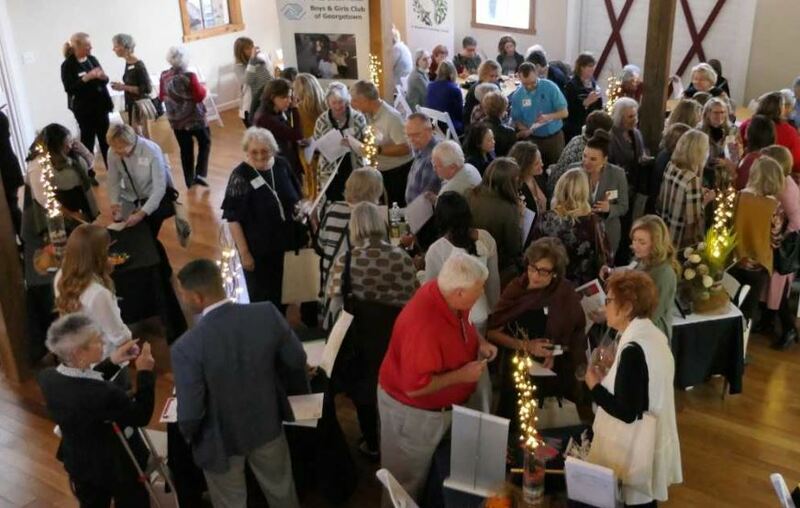 Party planners cleverly encouraged “maximum grantee visiting” by giving each attendee a one page “passport” and each nonprofit a “secret marker,” so your passport could be stamped as you visited. Fully-filled passports were entered into a door-prize drawing. Chatting one-on-one with our grantees, we learned more about the services they are providing in our community for so many folks of varying needs. A lovely buffet of light bites and tempting desserts, wine, live music by harpist and vocalist Kristen Gibbs, twinkly lights, indoor and outdoor space for mingling, tall cedar posts, and the historical site itself, all worked together like magic, making the evening full of fun visiting with old and new friends. Touring the lovingly-restored historic J.M. Page house (built 1903) was a special treat, as was hanging out in The Polo Barn (built 1930), which really was a polo ponies’ barn back in the day. As the evening closed, SoS Chair Lexi Elliott reminded us that none of the costs for our events come out of any of our grant funds and Karron Wilson, Membership Chair, spoke about this year’s membership drive that will support the grants we make in May 2019. Thank you to the committees who made the night special: Compliance, Events and Membership. And a very special Seeds of Strength THANK YOU goes to Cook-Walden Funeral Homes and Cemeteries for sponsoring the Harvest Fest’s food buffet, non-alcoholic beverages, and live music, and to member Rebecca Barrera for making that happen. Good things. Good neighbors. Plant and harvest. Together, that’s what Seeds of Strength members and our community partners do!